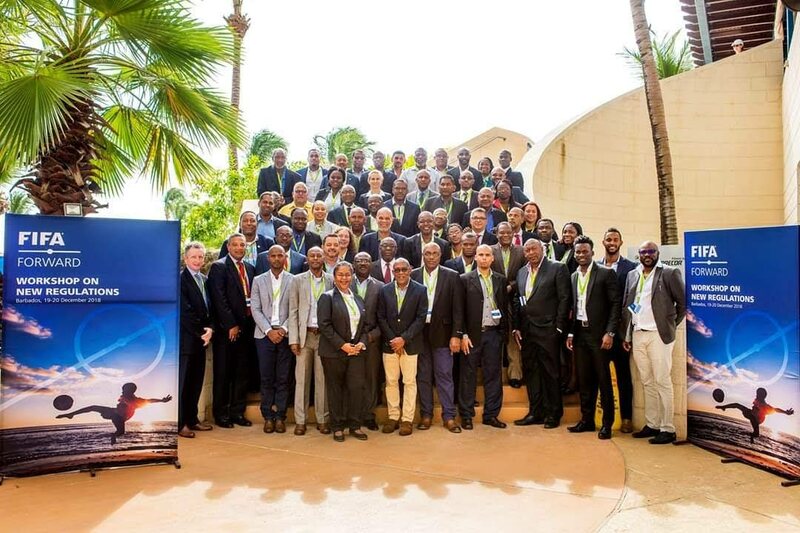 TTFA president David John-Williams, front row, third from right, and Camara David, former TT Super League secretary, front row, second from right, in Barbados for a FIFA Forward seminar in December last year. THE football-supporting public may have had good reason to believe the TT Football Association (TTFA) has a new general secretary in the form of David Camara. Camara, who was never an employee of the TTFA, is named as the association's general secretary on FIFA.com. Even more alarming is the fact that Justin Latapy-George, whose contract expired on November 30, continues to act daily in the very same role. The official FIFA web-page also indicated there are three vice-presidents: Allan Warner, Ewing Davis and Joanne Salazar, although two – Warner and Salazar – resigned from their VP posts last year. The field for TTFA treasurer is blank. Newsday sent an email to John-Williams asking how Camara's name came to reflect that of the association's general secretary on FIFA's website, if Camara signed any contract with the TTFA to reflect such and if the board was aware and gave approval. John-Williams's responded via e-mail: "Dear sir, I have not communicated such information to FIFA." Asked further whether the TTFA currently has an active general secretary, John-Williams said, "Maybe you should direct your question to the current GS and ask if he has been removed from his position or is he still in post. Too much mischief and agendas I am seeing." Newsday was unable to reach both Latapy-George and Camara for clarity on their positions as calls to their cellphone went unanswered. TTFA board members contacted yesterday said Latapy-George continues to share official correspondence with them, sits at meetings and conducts the regular functions of general secretary. Recently, board members chided John-Williams for allegedly carrying Camara with him to Barbados for a FIFA Forward workshop in December last year, which was exclusively for regional football association presidents and general secretaries. TTFA board member Keith Look Loy said he strongly believes John-Williams is moulding Camara for the position of general secretary, although a contract extension for Latapy-George was endorsed at a recent annual general meeting. Article 36 (f) of the TTFA constitution (Powers of the Board of Directors) says, "[The Board of Directors]: shall appoint or dismiss the General Secretary on the proposal of the President." Look Loy said, "Maybe he is waiting for him (Latapy-George) to voluntarily depart because he can't force David on the board, where I have been calling for months for a discussion (on the status of the general secretary)." Newsday tried to reach Concacaf senior projects manager Howard McIntosh, who visited TT a week ago, to shed some light on the issue. Newsday sent McIntosh a message asking who Concacaf recognises as TTFA's general secretary, since FIFA's website indicates Camara is the general secretary and John-Williams denied knowing how it got there. There was no response from McIntosh up to press time. During his visit, McIntosh was quoted in one online publication, Wired868, saying "the (TTFA) board should always be informed… The communication must be improved," in relation to the complaints by the members of the TTFA's board of directors that they were initially bypassed by John-Williams and the high-ranking visiting contingent, effectively breaking protocol. Reply to "John-Williams: It wasn’t me"